Does "Symbolize" support multiple inputs, such as the above example? What if i want to declare as many as 100 variables with subscript? I want to do differentiation on q1. I expect to get 2*q1*dq1, but Mathematica gives 0. Why is that? From this we can see that Symbolize makes use of TemplateBoxes so the easiest way to get the correct coding is to use the palette. For the other part of your question you probably should have found that you got an error when you entered a sequence of multiple inputs, so the answer is, no, it does not support multiple inputs. The objective is to take an expression and have it treated as a symbol. The first pic shows me entering q and a subscript box then in the next pic I have entered an underscore in the subscript box. So now any q with a subscript (Subscript[q, 1] and Subscript[q, 2] etc.) are treated as symbols. Not the answer you're looking for? Browse other questions tagged custom-notation or ask your own question. 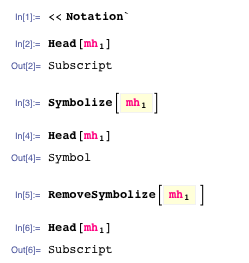 Is Package development (via InitializationCells) compatible with creating new Notations (via MakeExpressions)? Is RemoveSymbolize the reverse of Symbolize? How to construct custom operators with precedence?